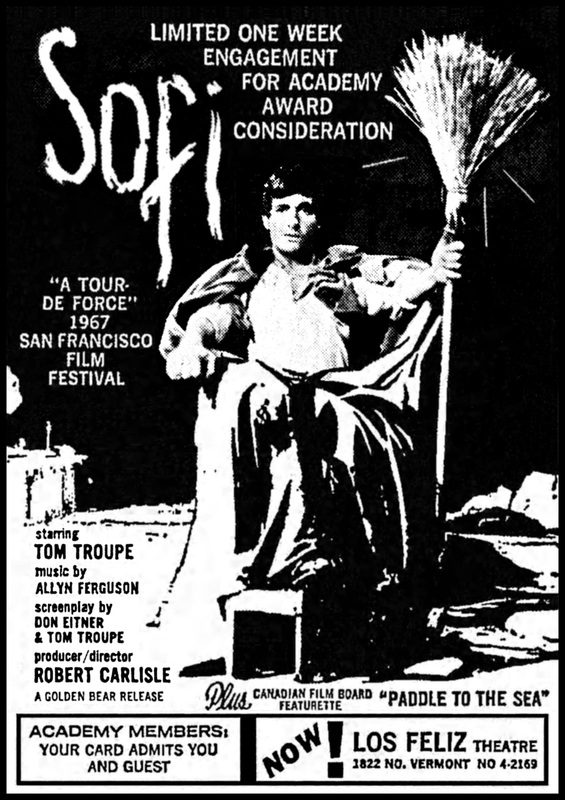 Adapted from Nikolai Gogol's 1835 short story "Diary of a Madman" -- a first-person trek into obsessive-compulsive behavior and insanity -- this low-budget indie feature is outwardly simplistic, increasingly melancholy and defiantly uncommercial, while providing a tour de force role to longtime character actor Tom Troupe (KELLY'S HEROES). 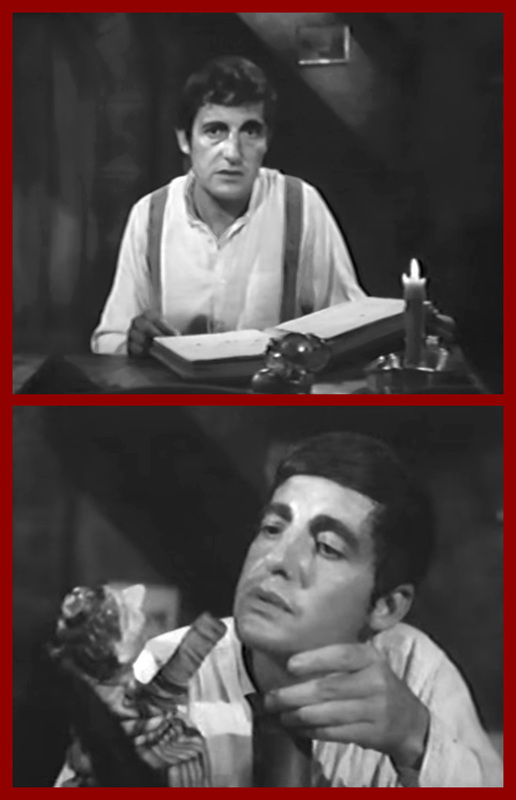 Shot in black-and-white, featuring only one actor and mostly taking place in one dreary room, the project began as a 1966 Los Angeles workshop, adapted by Troupe and fellow Melrose Theatre founding member Don Eitner from a 1963 London stage production by Richard Harris and Lindsay Anderson. But this cinematic record barely found a spot on the festival/arthouse circuit. It's consistently intriguing but, at 96 minutes, often a rather difficult slog... A lowly civil servant known only as The Clerk (Troupe) returns to his squalid little apartment after a day's work, jotting ideas into a diary and confessing to the camera. But while his initial thoughts are fairly commonplace complaints about his job, bosses and co-workers, the man begins to hear voices and gradually becomes lost in troubling fantasies, such as how a dog suddenly spoke to him in English. As the weeks and months roll by, he also repeatedly talks about a lovely young woman named Sofi, his boss' daughter, as well as the embarrassment he feels about his own poverty and growing annoyance at everyone around him. But as The Clerk's obsession with Sofi grows, he also becomes increasingly unhinged. The results are hit-and-miss to say the least, with long bouts of monotony (e.g., reading letters supposedly written between two dogs) balanced out by some wonderfully bizarre bits (The Clerk's sole companion is a tiny hand puppet, which he calls an "impotent little bedpost sitter" and ends up stuffing into his stove in a moment of anger). Eventually convinced that he's actually the fugitive King Ferdinand of Spain, with an old broom as his scepter -- which will surely win him Sofi's love! -- his diary entries become unintelligible, his home gets messier, his appearance more unkempt, and his delusions darker and more disjointed. Only in the final 15 minutes does the setting shift, with our broken Clerk still pining for his one great, imaginary love... Between the script's restrictive framework and the production's obviously threadbare budget, director Robert G. Carlisle (a music/sound effects editor on films like MARTY and SWEET SMELL OF SUCCESS, in his sole directorial feature) was fairly limited in terms of style or experimentation, and with the exception of a brief outdoor sequence under the opening credits, it's a totally stagebound work, with cinematographer Alfred Taylor (SPIDER BABY, KILLER KLOWNS FROM OUTER SPACE) doing his damnedest to energize the proceedings. It's primarily Troupe's baby though. First tackling this demanding role at 38 years old -- even as he was racking up guest spots on MISSION: IMPOSSIBLE, STAR TREK and THE WILD WILD WEST -- Troupe would continue to play it, around the country, for the next four decades, and as late as 2004 at the age of 76! No surprise, Troupe gives his all, only to have much of his performance's raw impact neutered in its transition to film, as he continually plays to the cheap seats. Ultimately, this is a fascinating project with more bluster than brilliance.